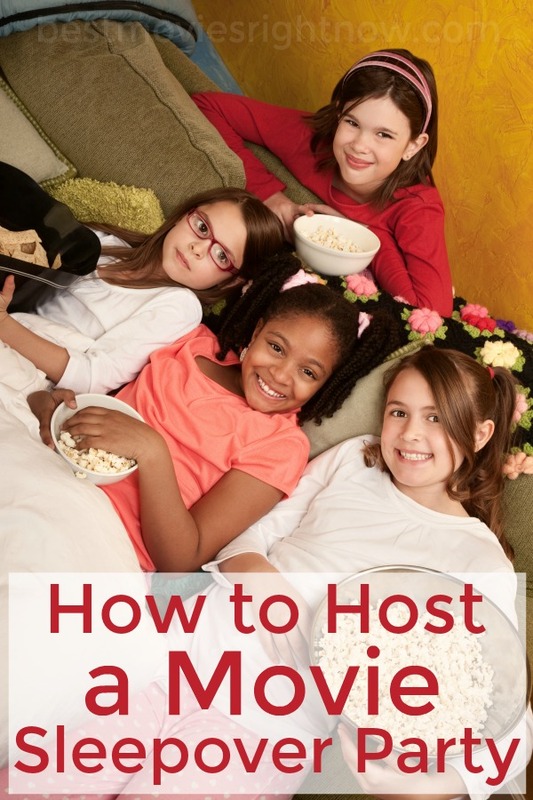 At home movie parties or sleepover parties are an inexpensive, yet fun way to host kids in your home. What do you do when school lets out for the summer? At home movie parties or sleepover parties are an inexpensive, yet fun way to host kids in your home. You pay for the entertainment once, save money by serving food in your home, and don’t have to worry about transporting (and keeping track of!) kids. I remember when we first moved into our current house, it was just two weeks before my kids’ birthdays (their birthdays are two days apart). To keep it low key and inexpensive, we invited several of their cousins over for an in-house party and sleepover. I bought food for dinner, snacks, breakfast, and lunch. The kids did karaoke using our computer and a mic plugged into our stereo. Then we screened a movie that night and one the next afternoon. We had just moved into a bigger place, so we didn’t have much furniture. But, this was great, as it gave the kids plenty of room to move around. If your kids are anything like mine, they were already begging for playdates with their BFFs the minute after school let out for the summer. Thankfully there’s an easy and inexpensive way to transform a typical playdate into a magical experience that your kids will love. The festivities will revolve around a family-friendly movie of your choice. But the movie itself isn’t what makes this get-together special. It’s really all about the setup and the setting. Lay out a soft and comfy space – Ensure that wherever the group is going to watch the movie is nothing but blankets, pillows and beanbags. Everything needs to be soft and comfy, because we all know no one is going to sit still or stay in the exact same spot for the whole show. Throw everything you’ve got onto the floor! Turn the room into a fort – Along those same lines, you could really set the mood by turning your room into one giant bedsheet fort that you’ll watch the movie under. If you can’t pull this off, you could probably still figure out a way to make a few small tent-like spaces around the room that the kids can go in and out of. Decorate with balloons – Balloons make everything better. You don’t need the helium kind… just blow up a bunch and have them around on the floor to add to the ambiance. Add a little glow – While we’re on the subject of lights, you know what all kids love? Glow sticks. Get a bunch and make them into necklaces and bracelets for everyone. Let the kids drive in – Set up a “drive-in” in front of your TV screen and give each kid a big box (or organizational bin, or laundry basket…) to sit in for at least part of the movie. They could even decorate them to look like cars before the show. Serve snack boxes – Make a “take-out tray” for each child’s snacks. All you need is half of a shoebox or any container that size. Pop in a water bottle or juice box, a small bowl of popcorn and any other treats and that’s it! You could have the kids decorate their trays beforehand, too. Offer a variety of snack options – Speaking of popcorn and treats, set up a popcorn bar with bowls of various toppings (chocolate candies, marshmallows, raisins, etc.) for everyone to be able to concoct their ultimate movie-watching snacks before showtime. You could do all of the above at any time during the day or evening, but if your child is old enough to have a sleepover playdate, then you could also set up sleeping bags after the movie is over right in the same room you decorated. And in the morning, you could switch out the popcorn bar for a cereal bar or waffle-decorating bar to keep the fun going! We hope your kids and their friends have a blast at their summer break sleepover! And we hope that you are able to have a little fun with it all, too.